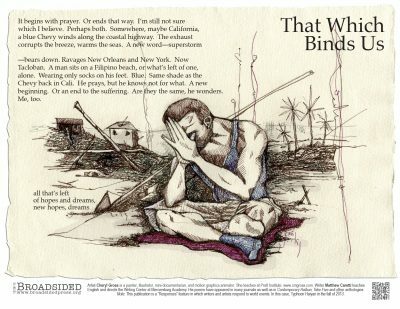 Why did this piece of art resonate for you or seem like it would give you an avenue into writing about Typhoon Haiyan? Poet Matthew Caretti: Empathy. Humans are hard-wired to respond when we see others in distress. I connected immediately with the man in Cheryl’s drawing—the anguish of his posture, the troubled prayers of his hands. These images, along with the color blue, guided my process and helped me to contextualize the tragic events surrounding Typhoon Haiyan. Poet Matthew Caretti: Again, it is this reality of our human interconnectedness—that which binds us. So a successful piece links the audience empathically to the content of the piece and inspires an action (or a response), whether internal or external. Poet Matthew Caretti is influenced in equal parts by his study of German language and literature, by his Zen training in the East, and by the approach of the Beat writers. He has had pieces published in numerous print and online journals, as well as Contemporary Haibun, Take Five and other anthologies. He currently teaches English and directs the Writing Center at Mercersburg Academy, a college preparatory school in Pennsylvania. Poet Matthew Caretti posting his collaboration (and more!) in the writing center at Mercerburg Academy, where he teaches.